Multi purpose clear polythene bags available in a wide range of sizes and thicknesses. These 500 gauge poly bags are heavy duty, durable and puncture resistant. 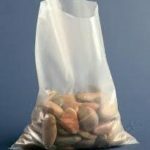 These practical polythene bags can be heat sealed, tied or stapled and are ideal for storing and packaging many different products, it is also approved for food use therefore it is widely used by industrial companies and for domestic purposes. Our polythene bags are an ideal storing and packaging solution because it provides protection from dust, dirt and humidity if sealed properly.